The following is a written step by step instructions based on the video content above: Each # step has the video time mark under if for simple reference. 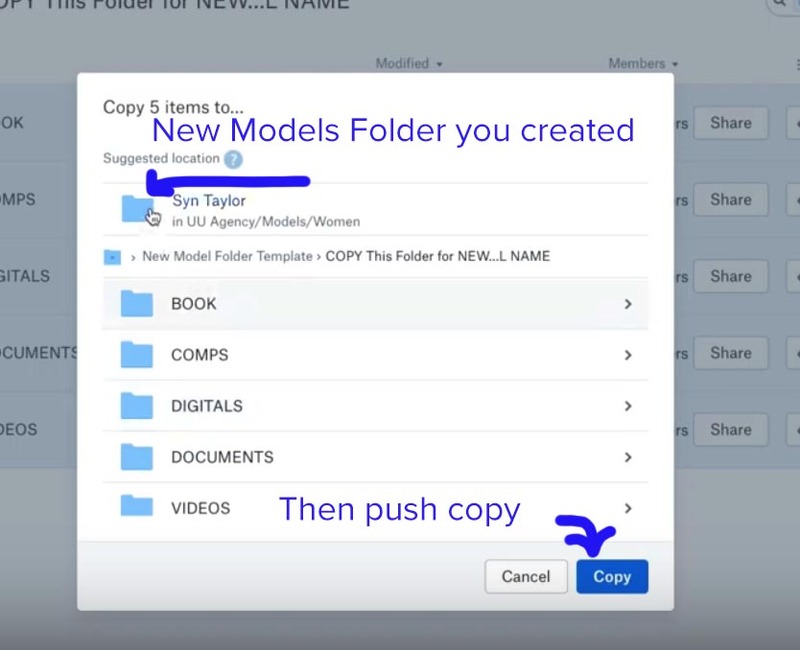 Please Note, Please always keep in mind, the content in each of the models DropBox folders should match that of the models MediaSlide folder content. Go to the UU DropBox account “MODELS” folder. If you do not have access please ask accounting accounts@unite-unite.com or text 571-216-5502. Select “New Folder” option from the right side menu. Go back to the Women folder and find the folder named “New Model Folder Template” and open it. Once in the folder click the select all check box. A popup window will ask you to select where to copy the folders to. 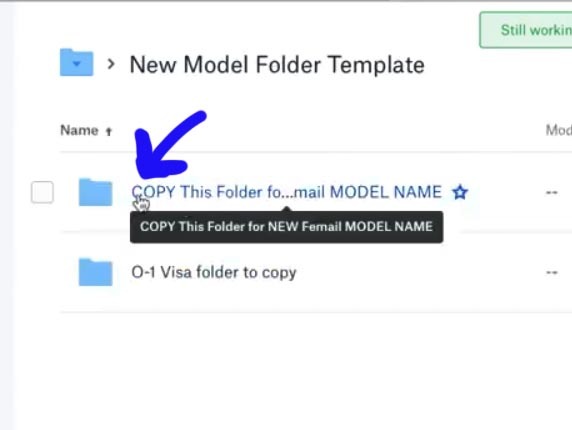 Select the New Folder you created for your model, it should be the suggested folder at the top of the window, if not navigate back to the “Women” and find the folder you created earlier and click on the “copy” button in the lower left corner. Thats it! You just created your first Model folder. If you need to now load Book or Digital images to the models DB folders please follow the instructions below. How to add images correctly to the DB folders. It’s very important that everyone follows the same procedure when updating a models image and digital folders. This ensures that the team is able to access the appropriate images for a specific client package or building a custom book. ALL IMAGES MUST FIRST BE LOADED TO THE MODELS ARCHIVES FOLDER. Go to the models folder and select the “BOOK” folder. Select the images from your desktop and drag all of them to the “ARCHIVE” folder. 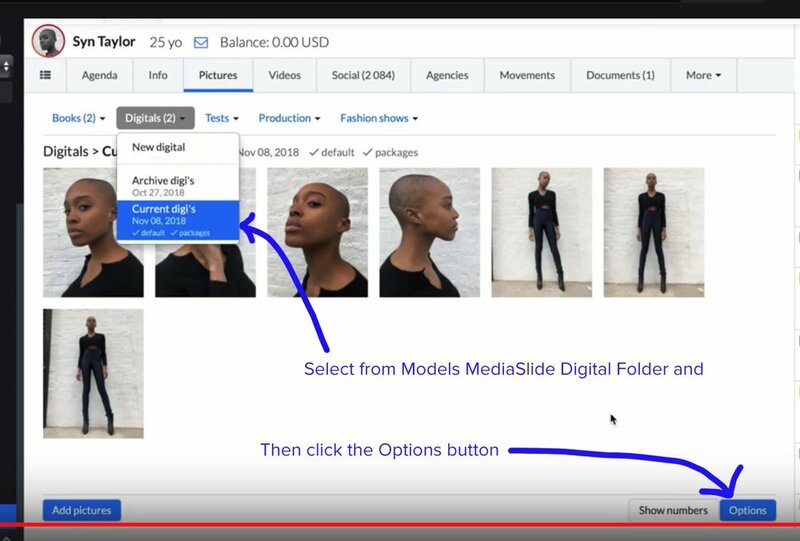 If you need to add a models Digitals (or book images) that are on the MediaSlide, continue on to step #4. Here we will download images from a models MediaSlide image archives and place them into their DropBox (DB) folders. Start by opening the models DB “DIGITALS” folder and select the “ARCHIVE” folder. Go to the models MS account and select the image group you wish to add to the DB. Here we are going to add her current “digi’s” collection and then click on the “Options” button in the lower right of the window. From the “Options” button select “Download HD” and all the images selected will download as a zip folder to your Download Folder. 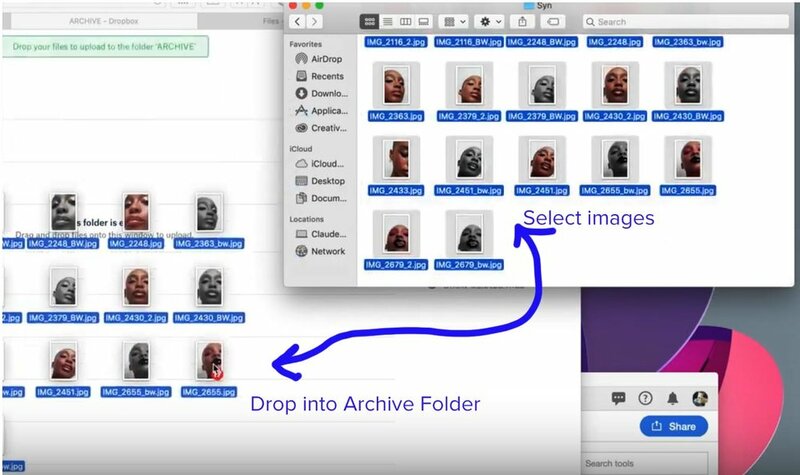 Select all the images to import and drag them into the Digital Archive folder.